I LOVE this idea... maybe it would help with the car sickness as well. ooh, that'd be much tricker, heidi. why don't we just make the driving test WAY harder? i can already hear the haters now. "Why don't you just assume the worst EVERY time, and leave a 100 yard gap between you and the car in front of you?" You're right. That is also a solution. This one is simply better. I agree with both Cheesehead and Kat. I am really guilty of putting my makeup on in the car (usually at traffic lights or during traffic jams!) and that's BAD. So, good point there. AND--I have trouble seeing far ahead when the traffic's thick, so it can at times be hard to anticipate a sudden hold-up. The only exception to this is when you're on 290, and can be 400% sure that right when you come around the bend by the fatally smelly landmine, everyone will screech to a halt for the 24/7 Oak Park-area traffic jam. That's also when you can REALLY safely put your makeup on, because you do very little actual moving. If you can breathe for the smell. I was just talking to Haley about this the other day. I've had the same idea for years, but I'm not enterprising enough to do anything about it. I always figured somebody had tried it back in the 60's and for some reason it didn't catch on. 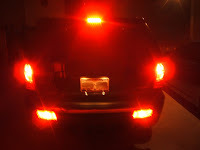 Variable intensity brake lights... I missed my chance. It doesn't necessarily have to be something big and noticeable that they are stopping for either. On my drive home, it could just as easily be a deer in the road. Great idea. Make it so.